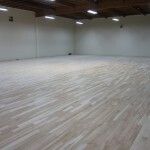 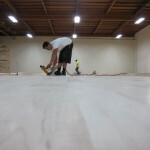 After the sanding is done, they will place 4 layers of matte finish coat on the floor. 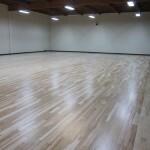 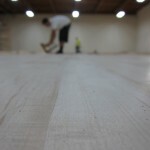 I did not want to put any coat, in order to leave the natural floor finish, when practicing, but the floor guys recommended that we put some type of finish. 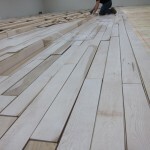 That way, it will protect the hardwood from water. 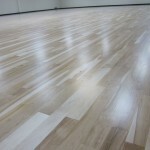 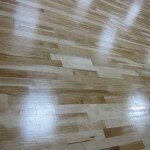 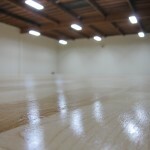 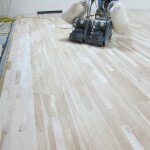 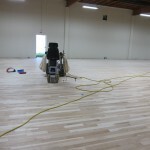 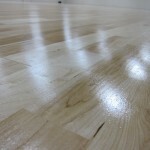 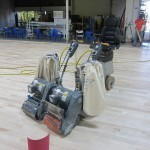 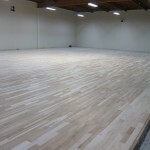 These pictures shows the floor shining, because the sealer is not dry. 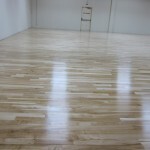 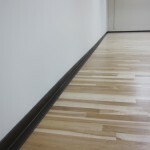 I chose the most natural color, which is the transparent finish, in order to be able to see the natural floor color. 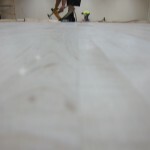 The next step is to sand down the surface of the top layer. 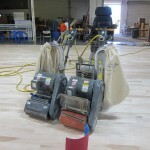 They brought in this machine that you ride on, and sand down by driving on the floor. 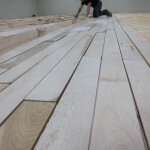 They finished placing all the maple surface! 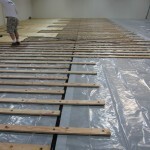 After all, it took them about 1 week to finish nailing down all the top layer. 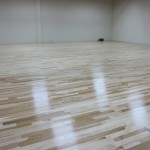 It looks very nice! 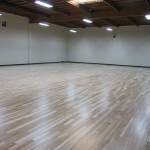 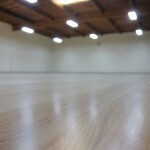 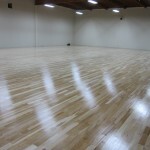 I can’t wait to practice here. 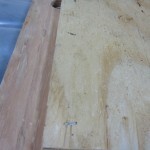 Right now the surface is still rough. 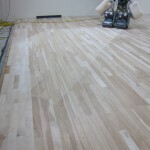 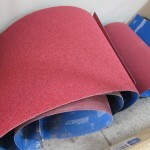 The next step is to sand down the surface with a fine sand paper. 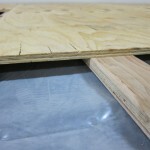 Once the sleepers are evenly placed at a interval of 1 feet, and then the Plywood is placed on top, then the 3rd layer of wood is placed. 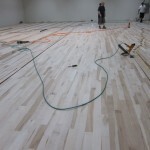 This is the final and top layer of hardwood. 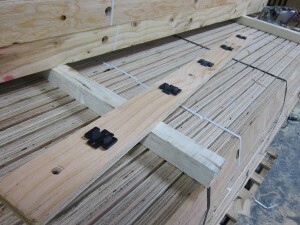 This wood was imported from Canada, which is supposed to have the best Canadian Maple. 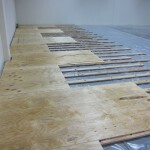 The hard wood is placed freely on top pf the plywood, to see the pattern of the wood grain, and also to see how it will look. 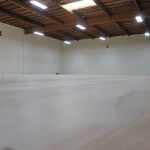 I can now start picturing how the Dojo will look. 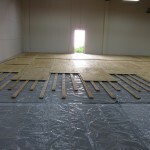 They start from the Center of the Dojo, and move outwards. 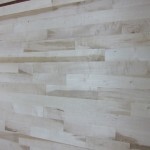 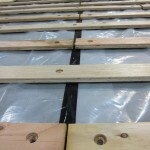 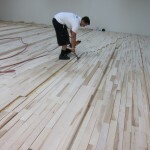 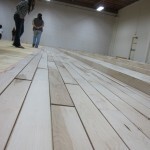 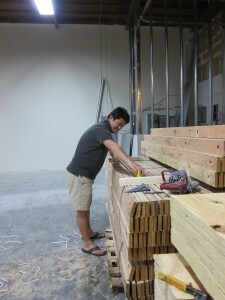 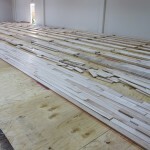 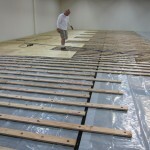 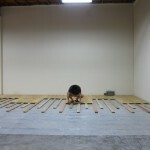 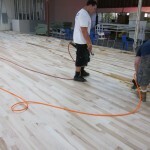 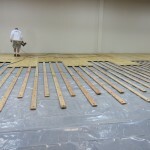 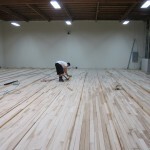 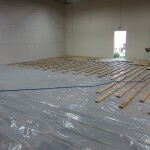 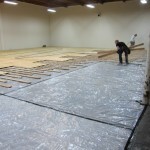 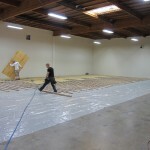 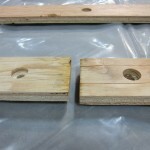 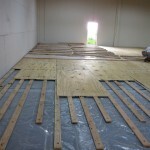 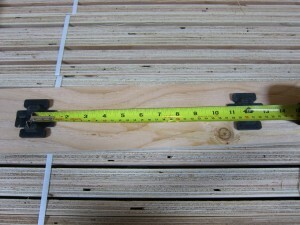 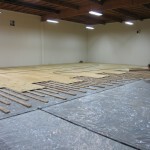 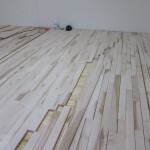 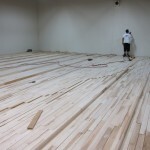 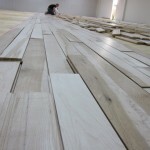 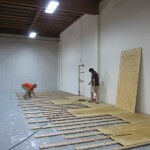 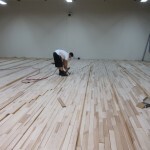 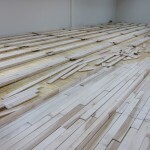 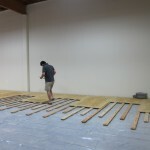 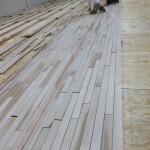 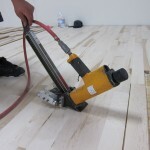 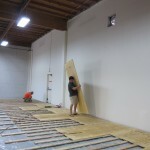 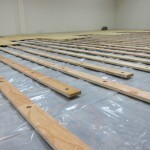 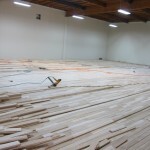 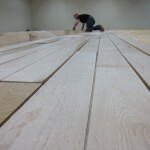 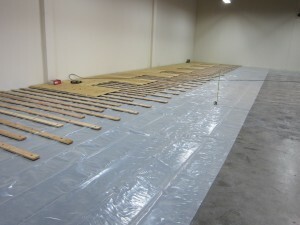 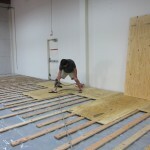 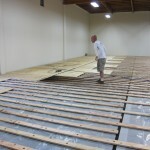 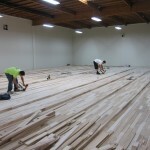 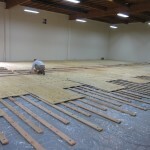 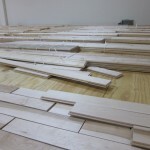 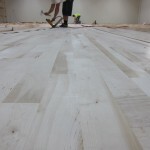 Once the vinyl sheet is placed, then the sleeper plywood is placed over the sheet 1 feet apart. 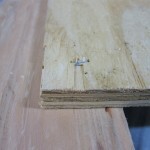 Then the plywood is stapled on to the sleeper. 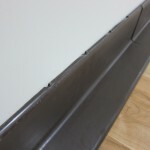 The sleeper is free over the concrete. 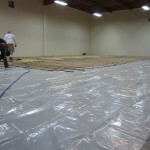 First a thick vinyl sheet was placed over the concrete, in order to keep the humidity from the floor to come up into the floor wood. 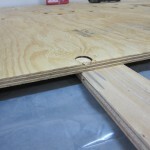 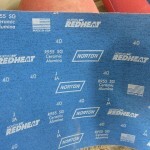 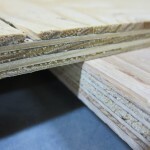 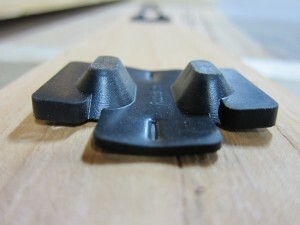 The first layer that comes on top of the vinyl sheet is the sleeper plywood (3/4 inches thick, 6 inches wide), with a special rubber on the bottom. 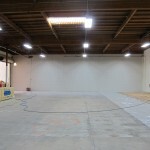 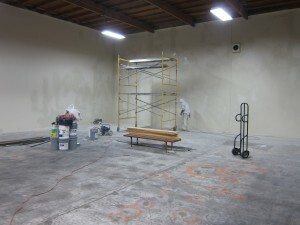 We first painted the walls before we started the floor construction.